It is no secret that the St. Louis Blues should be in the market to add a scorer or two for the 2017-18 season. 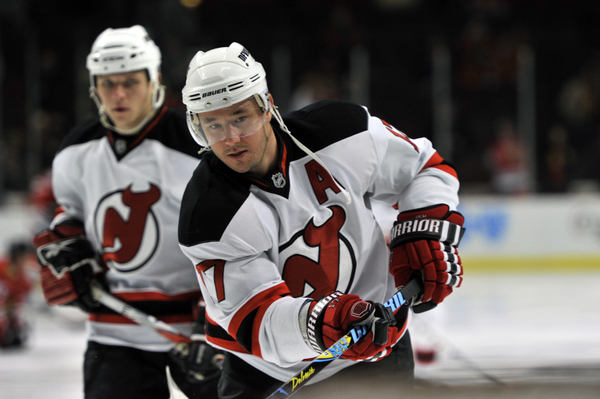 Former New Jersey Devils star Ilya Kovalchuk wants back in the NHL and the Blues could be a landing spot come October. Rumors of his North American return were confirmed by Devils general manager Ray Shero back in May. The rumor mill has been running rampant on possible suitors that would be looking to acquire the 34-year-old’s services. The New York Islanders, Montreal Canadians, Las Vegas Golden Knights, and even his former club New Jersey have been suggested. Now the Blues have become the latest team that could possibly throw their hat in the ring. Blues assistant general manager and last year’s goaltending coach Martin Brodeur is the face of the Devils franchise. During his time in New Jersey, he played with Kovalchuk and his familiarity with the club adds fuel to this fire. Brodeur witnessed first hand the 89 goals and 112 assists Kovalchuck was responsible for in a Devils sweater and he knows how dynamic he can be. Not only that, in 2015 the two were spotted together in Finland. The sighting may signify that there are no hard feelings between the two former teammates. The Devils already have $21 million in cap space heading into next season so the Devils shouldn’t mind taking on salary if the deal is right. Had Kovalchuk remained with the Devils throughout his 17-year contract he would be making $10.5 million next year, but because of his four-year hiatus, Kovalchuk will not receive anywhere close to that salary. To gauge what the market for Kovalchuk could be, we should look at what Montreal’s Alexander Radulov who signed a one-year deal worth $5.75 million last season coming from the KHL. If we take into consideration that Kovalchuk has an NHL pedigree that Radulov did not, we can predict that he could sign a deal worth up to $7 million. New Jersey is building for the future and will most likely be looking for young talent in return for Kovalchuk. The Devils are already in a good position after winning the draft lottery on April 29, meaning that top prospect Nolan Patrick will most likely put on a Devils cap on June 23. What makes this rumor interesting is the fact that St. Louis boasts one of the best cores in the entire NHL. 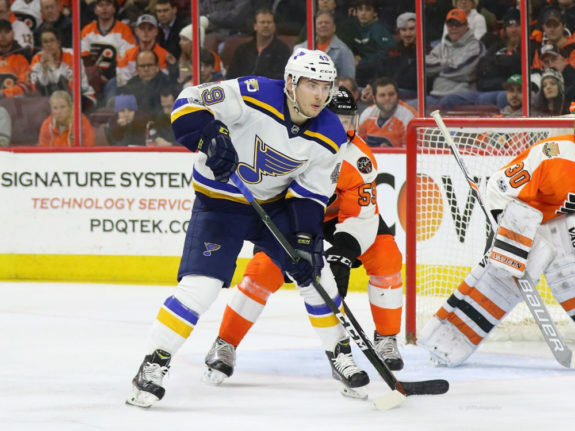 Vladimir Tarasenko, Alexander Steen, Jaden Schwartz, Paul Stastny and Alex Pietrangelo make up the Blues core five players that wouldn’t be involved in any deal. However, young prospects like Ivan Barbashev, Jordan Schmaltz, or Zach Sanford could be trade targets. The Blues will free up some cap room depending on who the Las Vegas Golden Knights select in the NHL Expansion Draft on June 21. Vladimir Tarasenko, Alexander Steen, Jaden Schwartz, Paul Stastny, Patrik Berglund, Jori Lehtera, Vladimir Sobotka, Alex Pietrangelo, Joel Edmundson, Jay Bouwmeester, Jake Allen. The only questionmark going forward is Lehtera’s spot. 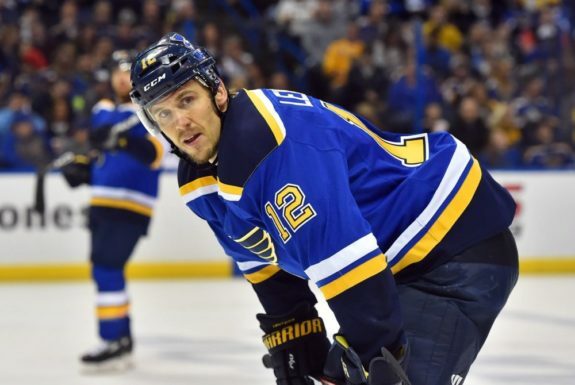 Some speculate that the Blues will opt to protect someone else after Lehtera’s disappointing 2016-17 campaign and even more disappointing postseason. The Blues may be interested in trading Lehtera to unload his $4.7 million dollar salary, but the Devils will most likely not be interested in acquiring his services. Jori Lehtera earlier this season, (Jasen Vinlove-USA TODAY Sports). A possible target for Las Vegas could be 25-year-old forward Dmitrij Jaskin. Unfortunately, that would only eliminate $1 million off of St. Louis’ books so it wouldn’t make much difference in their possible future salary cap troubles. A key to this entire possibility could be young defenseman Colton Parayko who is currently a restricted free agent. General manager Doug Armstrong called Parayko a “cornerstone player” for the Blues and Parayko seems to have every intention of playing for St. Louis again in 2017. With Parayko’s new deal on the books at some point, things could get dicey for the Blues. With all of the cap room New Jersey has, taking on Perron’s $3.7 million salary wouldn’t be a problem. Perron’s veteran presence in a young locker room gives the deal more appeal. Schmaltz is a top prospect in the Blues’ system and Gunnarsson is a solid NHL defender that would give the Devils some depth at the blueline. While the Blues may not want to give up Schmaltz the move could be something the Blues believe can get them over the hump in the postseason. Can you imagine a line of Kovalchuk-Schwartz-Tarasenko? Or even Kovalchuk-Statsny-Tarasenko? The possibilities are endless. The question will be what type of player would the Blues acquire? He is certainly not the same player that scored 98 points as a member of the Atlanta Thrashers in 2005, but Kovalchuk still showed his scoring ability in his recent years in the world’s 2nd best hockey league. Last season, he scored 78 points in 60 games. Kovalchuk and Tarasenko have played together in the past. In 2012, Tarasenko opted to play for SKA St. Petersburg instead of playing in the American Hockey League. Tarasenko scored 32 points in 31 games skating alongside Kovalchuk. A trade like this could seem desperate for some teams, but for a fan base as hungry for a Stanley Cup as St. Louis is, a move like this could be worth the risk. After all, Kovalchuk’s deal will more than likely be a one-year deal. If it doesn’t work out they can cut ties and move on. When you have a chance to fill a need that could get you closer to the ultimate goal, you have to go for it. For Armstrong, Brodeur and the Blues, it may be worse to pass on Kovalchuk and watch him flourish in another sweater rather than taking a chance that could pay dividends.